Speedy Electric & AC specializes in electrical contract work for home remodeling, adding fixtures and replacing wires. We offer specialized electrical wiring services to meet almost any wiring need. Our licensed electricians are ready to resolve any home electrical issue safely and quickly. Modern home construction includes a large number of electrical components to provide us with the conveniences that we have become accustomed to. Every electrical component has electrical wiring that provides it with power. This web of electrical wiring is hidden within the walls of your home. Without proper installation and testing, you could be opening yourself up for a dangerous situation. Electrical wiring is complicated and can be dangerous, so it is important that when you need to move or add electrical wiring, you work with an experienced professional. At Speedy Electric & AC, we have wired countless homes for remodeling projects, fire damage repairs, new appliance installation, outlet installation and much more! 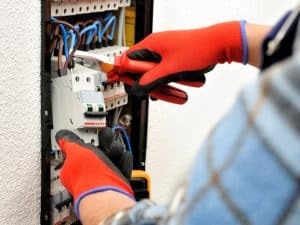 Speedy Electric & AC performs expert electrical wiring procedures that meet safety codes to protect you from electrical accidents and damaging fires. We always use accurate technical practices during wiring and installation.